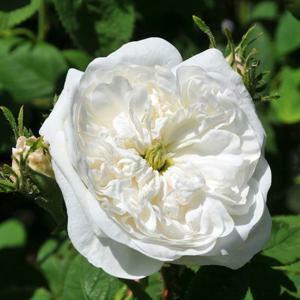 Vigorous damask rose with good fresh mid-green foliage. Clusters of strongly scented double flowers open a creamy pinkish-white before becoming pure white with a slightly greenish central eye. Only flowers once in summer, but over a relatively long period. Good disease resistance. Bred by Alexandre Hardy, Paris, France, 1932. Named after his wife and originally known as Rosa 'Félicité Hardy'.